The Salvation Army will be hosting their annual Christmas Dinner on Christmas Day. More than 5,500 people are expected to attend, and another 2,500 meals will be delivered to homebound individuals throughout the Valley of the Sun. These are plated meals served on real plates, with real silverware on tables with decorations and cloth napkins and tablecloths. Several grocery stores partner with the Salvation Army to provide the food. The event has grown so large that the Phoenix Convention Center is one of the only local venues that can handle it. In addition to the holiday meal, there will be entertainment, games, free long distance phone calls, haircuts, family photos and much more. Santa will be making an appearance and every child will leave with a gift. When: Sunday, December 25, 2016. Doors open at 9:30 a.m. and dinner is served at 11:30 a.m.
Where: Phoenix Convention Center in Downtown Phoenix located at 100 N. Third Street. Here is a map with the address, directions and instructions for getting there by Valley Metro Rail. Dinner will be served in the South Building. Who: Everyone, all ages. No restrictions, no reservations. Whether you are simply spending Christmas alone this year, or you would like to bring your family, you are invited. How much: Nothing. Dinner and all activities/gifts are free, compliments of the Salvation Army and their partners/sponsors. Parking: Be aware that parking meters are NOT free on Christmas Day in Downtown Phoenix. The Phoenix Convention Center East Garage is available for free parking for this event only. The East Garage has entrances on Jefferson and Washington between 5th and 7th Streets and it is located just east of the South Building where the Christmas dinner will be served. 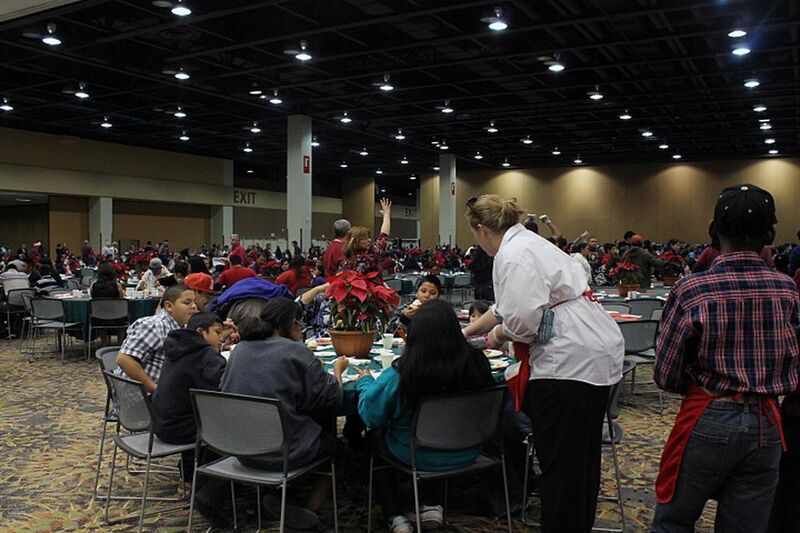 Homebound meals will be prepared and distributed from the Phoenix Convention Center. Meals will be delivered between 9:00 am to 12 noon on December 25. Homebound meal recipients are identified and registered by partner agencies and are not accepted on an individual sign up basis. It takes about 2,000 volunteers to make this happen! Believe it or not, people start signing up in October to help, and serving positions are usually all filled by December. You can sign up for available volunteer opportunities on this page. Children ages 10 and up may also participate as a volunteer, and, of course, helping to deliver meals to people who can't leave their homes is a great family activity where all ages can participate and contribute to others in the community. Did You Miss Your Christmas Angel Cut-Off Date? If you selected Christmas Angels from the Salvation Army trees at valley malls, but for any reason you missed the deadline for bringing those gifts back, you may certainly deliver those to the Salvation Army warehouse at 2807 E. Washington Street in Phoenix or at customer service at any of their partner malls after 12/ 24. Any toy donated after Dec. 23 will be distributed the following year — don't worry, they will get used! Visit the Phoenix Salvation Army website.